The first-ever motorized Nerf Mega blaster! Incredible rapid-fire speed to launch 2 dozen Mega Whistler darts. 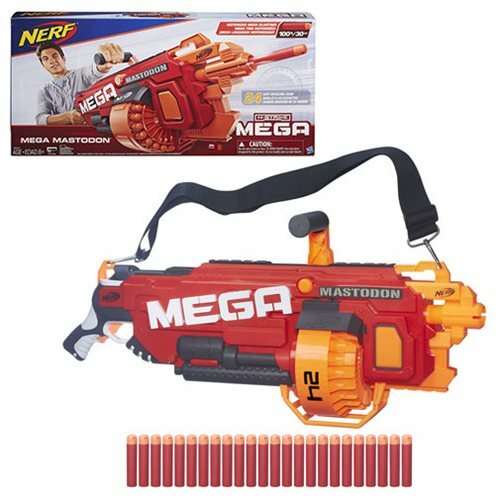 Dominate Nerf blaster competitions with the Nerf N-Strike Mega Mega Mastodon Blaster, the first-ever motorized Nerf Mega blaster! This massive 34-inch long blaster has the power and size to take command of the battlefield. It boasts incredible rapid-fire speed to send Mega Whistler darts screaming through the air. Like its namesake, the Mega Mastodon dominates the action with its intimidating size. Storm into the action with this mighty Nerf blaster and launch 2 dozen Mega Whistler darts with the screaming fury of a rampaging beast! Includes blaster, 24-dart drum (3 pieces), drum cage, 2 drum covers, handle, strap, 24 darts, and instructions. Requires 6x "D" batteries, not included. Ages 8 and up. Experience the excitement, energy, and attitude of the Nerf brand, and find out why It's Nerf or Nothin'. Nerf N-Strike Elite and N-Strike Mega blasters from Hasbro deliver the ultimate in blaster performance for Nerf battles. Please note: item will ship in plain brown box / frustration-free packaging.